Winter is coming and it’s time to plan activities for the kids. These backyard ice rink kits are a quick and easy way to set up your backyard for hours of winter fun. Backyard rinks and skating are one of the perks to living in a winter climate. If you live in Texas or Mexico do not buy one of these, they won’t work. If you do live in a place that has a winter season, get a backyard rink for the kids. It’s a great way to get them to exercise and stay outside in the fresh air for hours. Buying a kit makes setting up your family ice rink quick and easy. 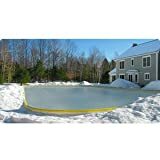 Depending on the size of your backyard you can set up any size rink that you want. From a 20 x 20 foot rink for the little ones right up to a massive 40 x 70 hockey rink. You can find something here to suit your needs. A little bit of effort at the start of the season will make the kids (and yourselves) happy and fit for the whole winter. The kids won’t want to go anywhere else when they can just walk outside and enjoy skating or hockey in their own backyard. Be the most popular parents on the block with these easy to setup and maintain backyard ice rink kits. The Iron Sleek Ice Rink Kit is great for the first timer as well as the seasoned rink builder. This rink is easy to install. It is reusable and can be stored neatly for nest year. From the least handy to the most experienced, with Iron Sleek TM everyone can build a backyard rink. This 25′ x 35′ rink comes with everything you need to set up a great hockey rink for the kids. Instructional DVD and Manual, paint, brush and roller,(to add hockey lines) plastic borders, sheet and spikes for easy setup. 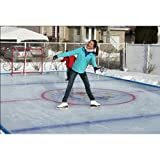 This 14’x 36′ premium backyard ice rink starter kit comes with brackets that cut installation time in half and allow you to build on a sloping surface up to 10 inches. The NiceRink #1 Starter Rink is a good size for the whole family. There is enough room for all aged kids on this one. Great for those multi person hockey games or plenty of room to just skate. Have a great winter and stay safe.